I am a lung cancer Clinical Nurse Specialist and a Mesothelioma UK nurse covering Kent. 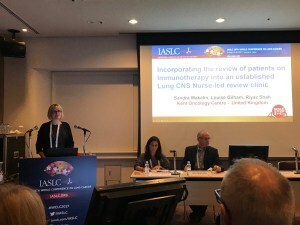 I recently attended the IASLC – World Lung Conference in Yokohama Japan where I presented on how the lung nurses successfully incorporated the review of patients on immunotherapy in an established nurse-led clinic. I am very passionate about nurses being given the opportunity to share and disseminate their knowledge and to celebrate nursing achievements both at national and international conferences. The World lung Conference is an excellent educational forum where professionals involved in the care of patients with lung cancer and mesothelioma are bought together to share their expertise, clinical practice, discuss future treatments and where the sole focus is improving the care delivered to patients. I was given the opportunity to attend the conference in Japan through an educational fund provided by Hasag. Lynne from Hasag said; We were delighted to be able to sponsor Louise to this fantastic conference. The knowledge that is gained during educational conferences is fundamental in keeping up to date with the latest treatments, trials and best practice. We are so proud to have helped.